Photo (5.5 x 4 inches) mounted on cardboard frame/backing (8 x 6 inches; the edges of the frame have been cropped from this scan). Photographer is F. A. Mack & Bro. of Pottsville, Pennsylvania. Otherwise undated and unidentified. This photo is pretty beat up, including a nasty crease down the center, but I love it anyway, so I thought I’d share. I’m sure all the hand holding is intended to reflect an affectionate camaraderie, but it also has the effect of making them look like they are bracing themselves for something. Judging by the color of the men’s hands they are outdoor laborers. The man on the left looks Italian. 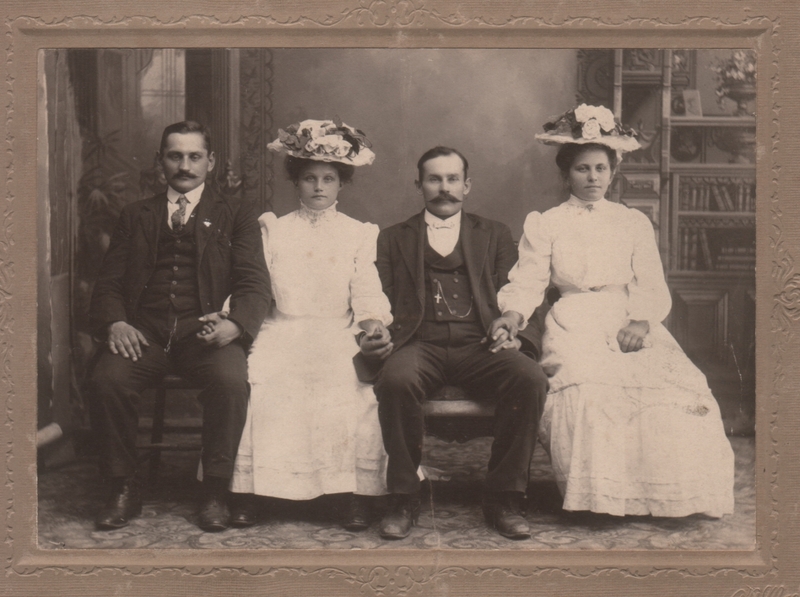 Given the Italian culture for familial closeness I wonder if these folks might be first generation immigrants. It is such fun to speculate, but I would dearly love to know their stories! I was getting a sense of some sort of Mediterranean heritage, too, but that’s just a guess on my part. I agree that it’s fun to speculate. Are they a pair of couples? Siblings or cousins, perhaps? I provide as much information as I’m sure of (in this case, the name and location of the photographer), but the rest is pretty open to interpretation. My eye keeps being drawn to the cross on the chain across the vest of the man on the right (watch fob?). Is he simply religious or does it have something to do with his occupation? Good question, I don’t know. I noticed it, too, and thought it was an unusual way to wear a cross.